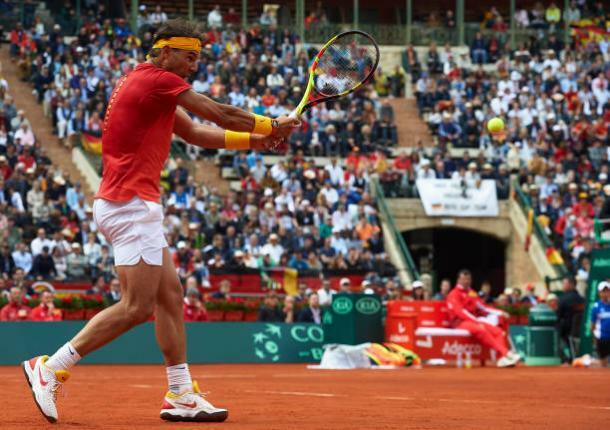 World number one Rafael Nadal made an emphatic return to tennis after defeating the tricky Philipp Kohlschreiber 6-4, 6-2, 6-3 after 155 minutes as the Spaniard's win proved pivotal for Spain heading into the second day of action at the Davis Cup. 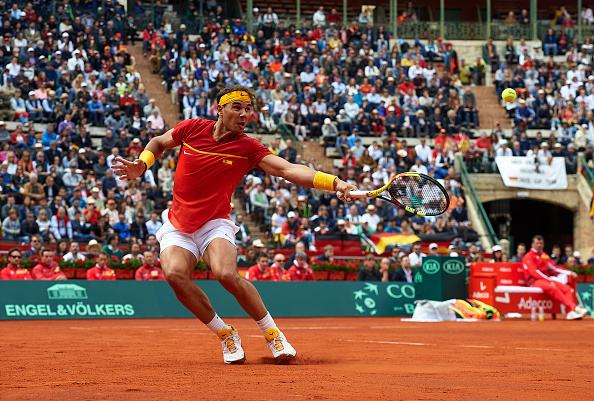 Rafael Nadal got past a tricky opponent in his comeback match as he helped Spain to level the scores against Germany in their Davis Cup quarterfinal tie, ousting Philipp Kohlschreiber with a stunning 6-2, 6-2, 6-3 scoreline in his first professional match in nine weeks. After compatriot David Ferrer fell to Alexander Zverev earlier on, the world number one had the nervy task of keeping his nation in the tie and perfectly completed the job with a 155-minute marathon victory over the German. Returning to professional tennis for the first time in nine weeks, Nadal had an encouraging start to his clay court campaign after looking in top form. He fended off a break point and was extremely solid at the baseline which prevented Kohlschreiber from taking the early lead. The German would have rued his missed chances as Nadal started to dominate the long rallies which saw Kohlschreiber getting increasingly frustrated with himself. An exchange of breaks followed as both players took some time to get used to the tricky surface, and the first set seemed to be over after Nadal stamped his authority across the court, opening up a formidable 4-1 lead and earning multiple break points. 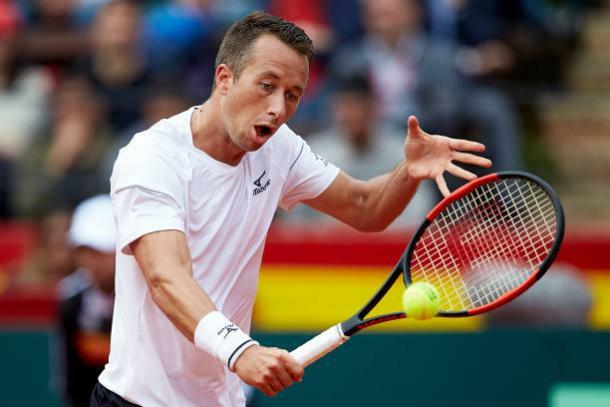 Nonetheless, Kohlschreiber never seemed to give up and endured through a nervy service game to keep himself in contention. However, it seemed to be just too late as Nadal saved yet another break point with a forehand winner, before clinching the opening set 6-2 after a marathon 51 minutes. Everything was going the top-ranked player’s way especially when he seemed to have found his groove on his favorite surface, soon taking a 3-1 lead in the second set in a blink of an eye. Dictating play with his forehand and utilizing the angles on his groundstrokes, he was strolling through the encounter and was on-course to claim the win. Unexpectedly, the longest game of the match soon followed, with Kohlschreiber displaying his tough mental strength and prevailing in the marathon 24-point game and impressively saving five break points in the process. Both players struggled on the backhand wing, and they combined for just a shocking three winners off that shot throughout the encounter. Rattling off eight of the last 10 points of the set, Nadal comfortably took the second set 6-2, losing just a mere three points on his clinical serve throughout the set while breaking serve twice. A sudden loss of focus saw Nadal missing everything in his game, and a costly double-fault could not have come at a more crucial time as Kohlschreiber took the early lead in the third set, with an improbable comeback looking on the cards. Yet another unforced error from the German immediately gifted the break back to the Spaniard, and he had to fend off a break point in the fourth game as he remained level on the scoreboard with some inspiring tennis. 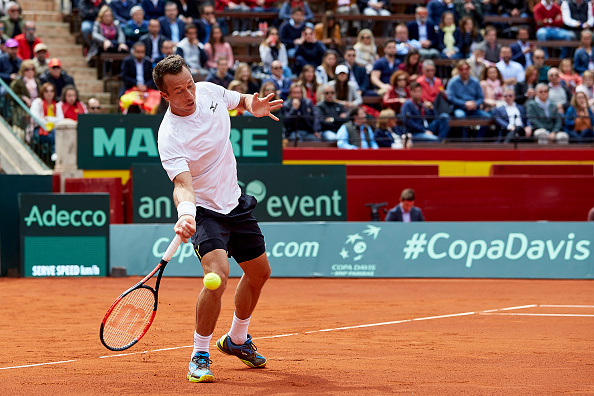 Though, things started to collapse in Kohlschreiber’s game as his forehands started to misfire once more. Trailing by two sets and 2-5 down, the match was almost certainly over, though the proceedings got complicated when the German saved a match point to extend the match, for at least one more game. However, Nadal looked flawless on his serve as he eventually served out the win after a marathon two-hours, 35-minutes, grabbing the win in straight sets and leveling the tie 1-1 at the conclusion of the first day.